This Instant Pot Taco Pasta makes a quick and easy weeknight dinner that’s sure to be a hit with the entire family! I love having this easy cheesy vegetarian pasta dish in our weekly dinner rotation and keep things fun by to changing up the toppings each time based on what ingredients we have on hand. I’m writing this approximately 3.5 seconds after devouring a big bowl of this Instant Pot Taco Pasta and HO-LY-COW it’s good! My husband is going to freak when he gets home. He’s been asking for cheesy baked pasta for literally weeks now and MAN did I deliver! Well, minus the baked part, but he can reheat his bowl of yum in the oven so I call that a win! Baked schmaked – the Instant Pot just legit changed my pasta game forever. SIDENOTE: I almost wrote out tomatoes tomahhhhtoes here, but that phrase is now banned in this household. Paul texted me from the grocery store last week to ask which pita bread I wanted and that was my cheeky response. To me, it meant “whichever bro, they both do the same thing” but somehow he interpreted it as “buy ALL THE TOMATOES!” To say we currently have an abundance of tomatoes would be an understatement. Oops! Clearly an all caps affair over here. I’m going to quit my yammering so you can get this deliciousness in your face, pronto! I used medium pasta shells here but any other medium pasta shape should work pretty well. I’m thinking rotini, elbows, or penne would do great! 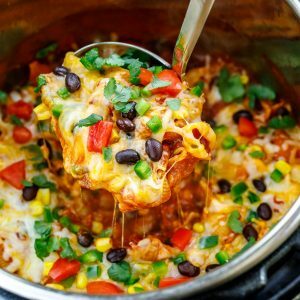 This Instant Pot Taco Pasta makes a quick and easy weeknight dinner that's sure to be a hit with the entire family! I love having this easy cheesy vegetarian pasta dish in our weekly dinner rotation! Set your Instant Pot to SAUTE function and add your oil. Test for readiness by adding in a piece of onion and, once sizzling, add your onion and sauté until tender. Next add your garlic and cook for an additional 30 seconds until fragrant. Press the off button then add your water, enchilada sauce, diced tomatoes, chili powder and cumin. If desired you could use a bit of taco seasoning here to replace the individual spices. For a bit of heat, feel free to add cayenne pepper or your favorite hot sauce. Lastly add your pasta and pat down into the liquid without stirring, so noodles are covered. Lock the lid, ensuring valve is in sealed position. Set Instant Pot to 3 minutes at HIGH pressure. Once the IP beeps, quickly release the pressure by turning the valve to vent and releasing the steam/pressure. Once the pin has dropped you may safely remove the lid. The pasta will seem a bit watery at first. Add your corn and black beans and mix well. Season with salt and pepper, to taste and sprinkle with cheese. Return the lid to the pot and allow the cheese to melt and the beans to warm through, approx. 1-2 minutes. I like my pasta slightly al-dente so if you'd like it a bit softer simply let it sit a little longer in the pot with the lid on and you're good to go! Time to dig in! Plate with all your favorite taco night toppings and get ready to faceplant! I added tomatoes, jalapenos, and cilantro to mine with a dollop of sour cream - yum! * If using fresh or frozen corn, simply steam/thaw first before adding to pasta. ** For the cheese feel free to use freshly grated cheddar or pepper jack cheese (I used a tasty combination of both!) or even a bag of shredded Mexican cheese blend. As with all Instant Pot recipes, be sure to stick with the liquid-to-pasta ratio in the recipe below and follow the instructions as written to prevent the pasta from sticking to the bottom of the pot and activating the auto-shutoff feature. As with all Instant Pot recipes, be sure to stick with the liquid-to-pasta ratio in the recipe below and follow the instructions as written to prevent the pasta from sticking to the bottom of the pot and activating the auto-shutoff feature. It may seem like a lot of liquid at first but the pasta needs a fair amount to cook and will soak up the water, leaving a thick and velvety sauce behind to coat your noodles. can I make this taco pasta vegan? Yes! All you’ll have to do is skip the cheese! If you want a bit of creaminess or cheesiness to the pasta feel free to swirl in some cashew cream after cooking or replace the cheese in the recipe with your favorite soy/veggie cheeze. When choosing toppings, go nuts! There are a number of awesome vegan toppings for this dish in the list below. 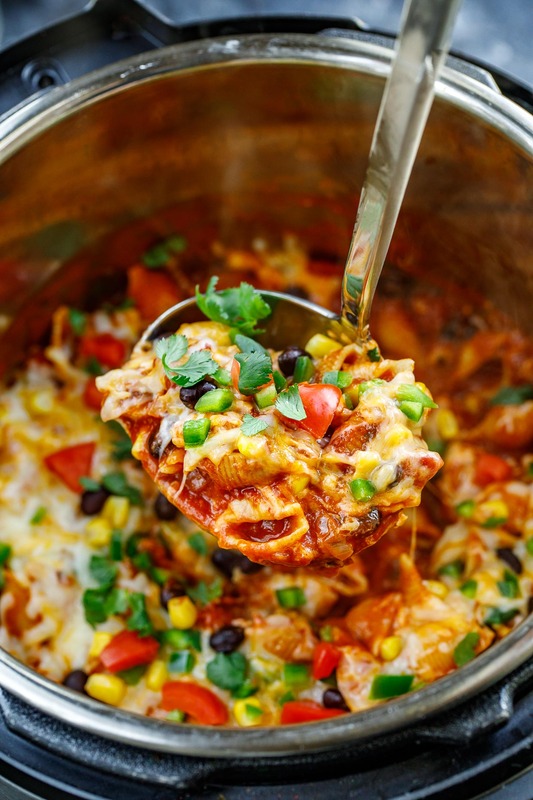 If you’re looking for a stove-top version of this pasta, try my Healthy One-Pot Enchilada Pasta – it’s vegetarian with a tasty vegan version available too! Choose your taco night favorites from the list below! Anything goes with this easy, cheesy, one-pot pasta dish! No matter how you top it, this tasty taco pasta is a home run dinner! 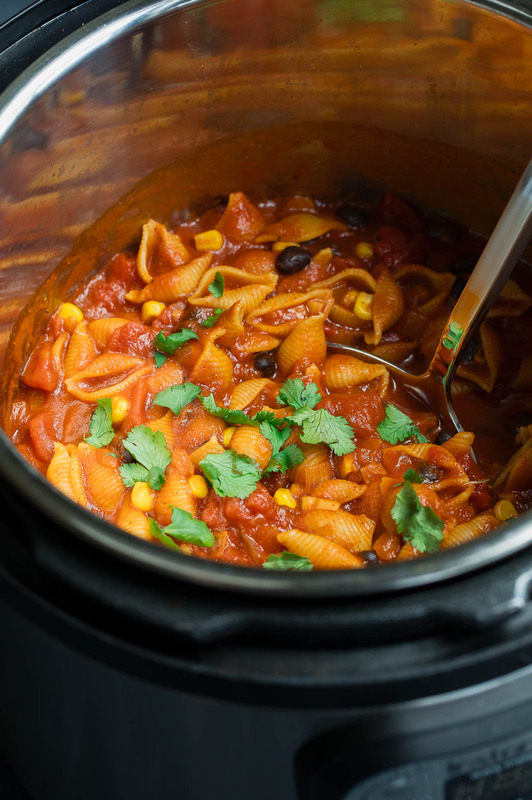 If you get a chance to try this tasty Instant Pot Taco Pasta, let me know! Leave some love in the comment form below or tag your photos with @peasandcrayons on Instagram so I can happy dance over your creation! Have a question on substitutions or swaps? Shoot me a comment below! Do you use canned beans or dried beans for this recipe? Hey Caitlin! You’ll want to use canned or pre-cooked here. When time permits, I like to cook a big batch from dried beans and then freeze them in 1 cup portions until I need them – then I just defrost and use in recipes! Hi! 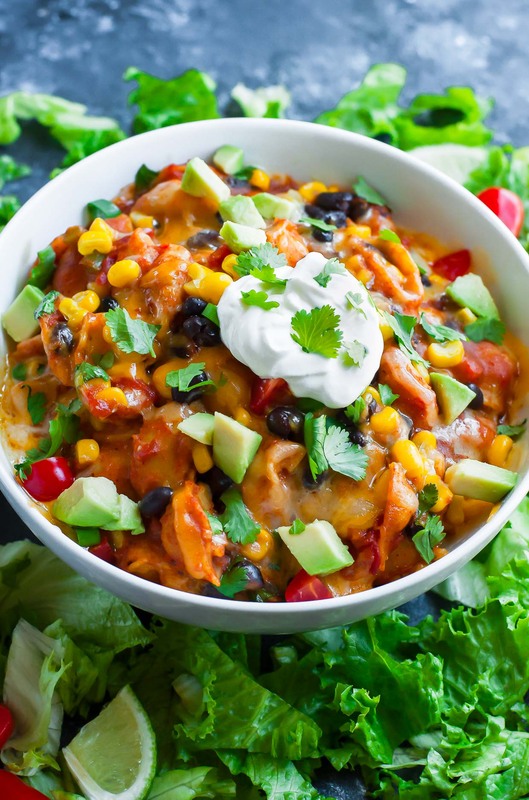 I don’t have an instant pot but would love to make this in the crockpot! 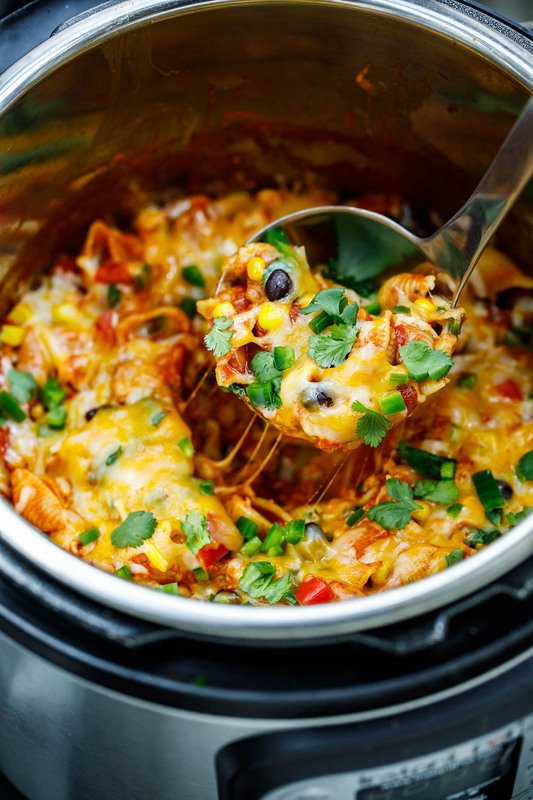 Do you know the steps to make in the crockpot? Hey Kyra! I know how to make it a one-pot pasta dish stove top (lemme know if you want the instructions for that!) but have never tested a pasta dish in the slow cooker b/c I keep hearing mixed things about how the pasta cooks in it. Do you make pasta dishes in the crockpot a lot? Thoughts? This was really tasty for a quick dinner. I used regular small shell pasta. Turned out great! I can see what you mean about having fun with toppings. We just used sour cream and cheese tonight, but when I make it again (of course I will!) I’ll add avocado, tomato and green onions. I would love to make this on the stove top because I don’t have a slow cooker. I already made the enchilada pasta which I love, do I do this pasta the exact same way? Yay!!! So glad you enjoyed it Che’Yona! Hey, what’s a substitute for the enchilada sauce? Hi Che’Yona! You can make your own version using tomato sauce, broth, spices, etc… here: Enchilada Sauce Recipe You could also simply add canned (plain) tomato sauce in place of the enchilada sauce and season to your liking with cumin, chili pepper, garlic powder, salt, and pepper. You could also add ground cayenne pepper if you’d like the sauce to be spicy. OMG…. this is so good. I cheated and doubled the recipe and added a lb of hamburger meat. It is really good!!!!! The family likes it as well. Can I add ground beef to this recipe? Yes absolutely! My family adds 1/2 pound of ground turkey to theirs and ground beef works too! YUM! Can I do this in a slow-cooker? This was the perfect meal for that busy weeknight dinner!! It was very easy to prepare and all three kids loved it, the hubby thought it was pretty good also!! The kids spiced up their individual bowls with their choice of toppings and came back for seconds. I will definitely be making this again in the near future!! I just purchased my Instant Pot and decided on your Taco Pasta for one of my first endeavors! My husband thinks all meals should have meat, so I browned 1/2 lb of ground Turkey and 1/2 lb of ground Turkey sausage first in the Instant Pot. Then I followed your instructions. My daughter and one of her girls are with us. It was a huge hit! Thanks! 2 thumbs up! Super easy to make and we absolutely loved it! It will definitely be at the top of the make again list! YAY! So happy to hear it Tracey, thank you! Honored to earn make-again status. Oh my goodness, the COLOURS in this pasta! It would cheer anyone up at the dinner table! Those toppings must take it to the next level. Delicious! Another great recipe to try with my new insta pot that I just bought. Thank you! Oh no! Jen, do you mind helping me troubleshoot? Were all the ingredients used as listed above? Any additions or extras mixed in? Which type/brand of pasta? Did you use an Instant Pot or a stove-top pressure cooker or something different? Thanks for your help! I would love to make this but don’t have an instant pot. 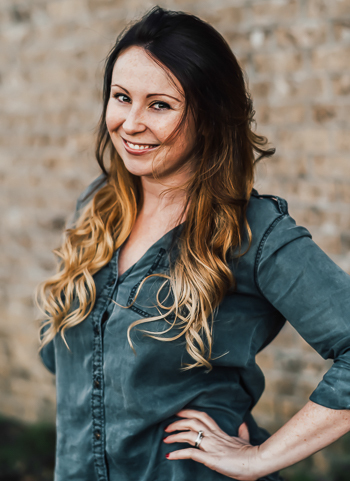 Can I make it on the stovetop or slow cooker? Yes absolutely Caroline! 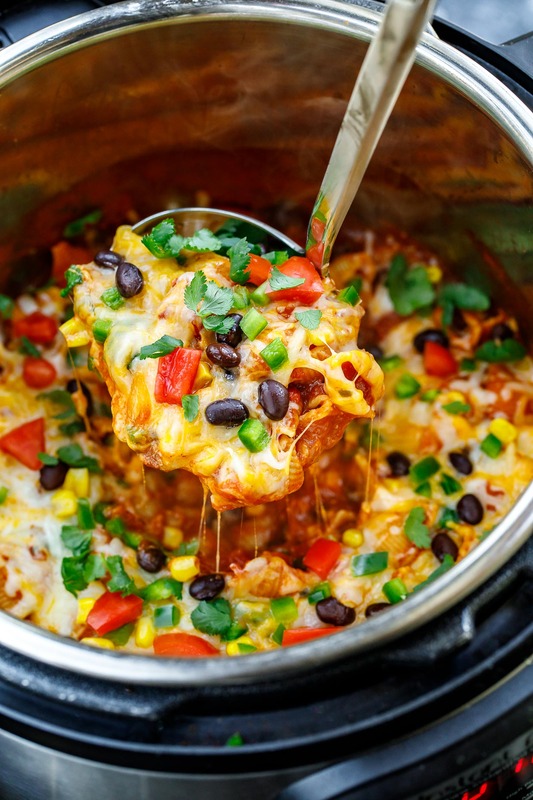 You would use the same method in my stove-top enchilada pasta and it comes together super fast! That looks so yumm.Will try for sure! Hope you adore it, Ash. Thanks!